Apps Script is good for automation. Through it, you can directly access Google’s many services, such as Google Sheets, Gmail, Google Docs, Google Calendar, and more. With a little bit of imagination, you can create very exciting Apps and add-ons using Google Apps Script. Unlike AppEngine, which first asks you for your credit card, Apps Script remains free so far. At the very least, Apps Script is good for quickly creating “proof of concept” mockups or even prototypes. There are different use cases for Apps Script. Primarily, it can be used to create add-ons for Google Sheets, Docs, or Forms. However, it can also create “standalone” web apps. We will explore the standalone web app option in this article. There is no direct way to use npm modules (it is still possible, though, and I will show you how). It is quite difficult to create a good UI (with bootstrap, Vue, or even custom CSS). We have to find ways to inline custom script into HTML pages. You get a long, ugly URL as the address of your web app. It is difficult to share, and forget hosting a commercial offering on such an address. This article series is my attempt to circumvent Apps Script’s limitations and add some cool awesomeness to “standalone” web apps and add-ons. First, you have to get familiar with the Apps Script environment. Google provides a command line tool called clasp to manage Apps Script Projects locally. Once installed, login to your Google account. This will open an authorisation page in your browser. You have to complete the steps. Once these steps are done, you are ready to create your first Apps Script Project. clasp create --type standalone --title "first GAS App"
For a webapp type Appscript project you need to have a function named doGet(). doGet() is the function that does the rendering of the webpage. In the example above, the output is a simple text. A common webapp should return a complete HTML page. We will go with the simple text for keeping this first project as simple as possible. This should open your browser with your new web app. Our next step is to use ES6 in Apps Script. We will use babel to cross compile from ES6 and will use webpack to create a bundle from the generated code. Let’s look into the project structure. The “server” sub-folder contains the code. api.js file contains the functions that we expose to Apps Script. In the file lib.js we have es6 code. From this lib module, we can import other es6 files and npm packages. We use webpack to bundle the code and babel to do the cross compilation. This means that webpack will expose a global variable AppLib through which you can access the classes and functions exported in the bundle. Now see the file api.js. We are using Object.assign() which is not supported by Apps Script. When babel cross-compiles lib.js, it will generate compatible code that works on Apps Script. "deploy": "npm run gas && cd dist && clasp push && clasp open --webapp"
Then we can just use “clasp” to upload the code . See the script “deploy” in package.json. 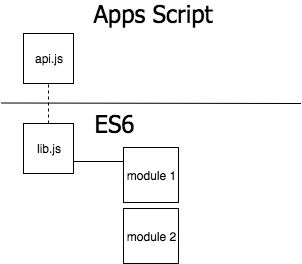 clasp create --type standalone --title "Apps Script with Webpack and babel"
One of the limiting features of Apps Script is that there is no easy way to integrate npm like packages to your project. For example, you may want to use momentjs to play with date, or lodash utility functions in your script. There, indeed, is a Library feature in Apps Script but that option has several limitations. We will not explore the library option of Apps Script in this article; we will install npm modules and bundle those modules using webpack to create an Apps Script compatible package. Now let us use some momentjs features in our Apps Script project. Packages that wrap the Google APIs, Gmail, Google Sheets, Google Docs, other public APIs Oh we are going to have lots of fun! Another important half is remaining though. So far we have seen only a simple text interface for our web apps. How about using modern CSS frameworks, bootstrap, bulma, material design, and also VueJS, React and building some single Page Web apps on Apps Script? Yeah, we will do it. We will use bootstrap, Vuejs in client side and Apps Script on server side and will build a single page app.